Innovation driven by cloud, NFV, IOT, video content and virtual reality is compelling the delivery of increasingly distributed computing options. These environments will need to support technical requirements such as latency, connectivity and power management while adhering to regulator factors such as HIPPA data security. 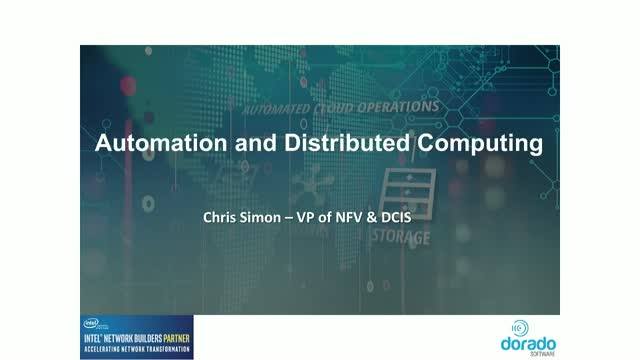 Distributed computing will require a number of infrastructure form factors such as HCI, private cloud and embedded computing paired with a myriad of operational environments process such Nutanix, Azure and OpenStack. All these are delivered in diverse partnerships and business models. In this presentation, we will discuss automation opportunities that allow all stakeholders to effectively deploy and monitor the underlying infrastructure while orchestrating and managing individual functions that make up the distributed computing services - all with minimal and often remote support staff.